Rather than spending half the day in the car battling traffic on the way to the shore, we decided to have a stay-cation in the relaxing comfort of home. A day that started by watching bike races on TV, followed by walking slowly around the property, swimming laps in our neighbor’s pool, and cooking from the heart. This day was soothing for the body and soul. The day concluded with a casual dinner that I cooked for my husband and in-laws. Even though this is not a traditional summer meal, it was satisfying and light served with a red leaf lettuce salad (bought locally from the Farmer’s Market) and yellow string beans. Seasoning blend: 2 tsp. sea salt, 1 tsp. each: granulated garlic, thyme, and tarragon, 1/2 tsp. black pepper. Season roast with seasoning blend 2-24 hours prior to cooking and store in refrigerator to ready to make this recipe. Remove roast from refrigerator 1 hour prior to cooking to let the temperature of the meat come close to room temperature. Preheat oven to 275 F. Heat lard in an oven safe saute pan. Brown roast on each side, until lightly browned all the way around. Place saute pan with roast in oven and cook uncovered for 40 minutes (20 minutes per pound will bring the temperature to medium-rare). Remove from oven, place in a separate shallow dish to catch juices, cover, and let rest for 20 minutes before slicing. Slice thin and serve with wine sauce. For a wine sauce. Place the pan that the roast was cooking in back over low heat. Add 1/2 c. red wine, simmer for 20 minutes to reduce the sauce and cook off alcohol. Strain through a fine-mesh strainer and then whisk in 1 T. organic butter. 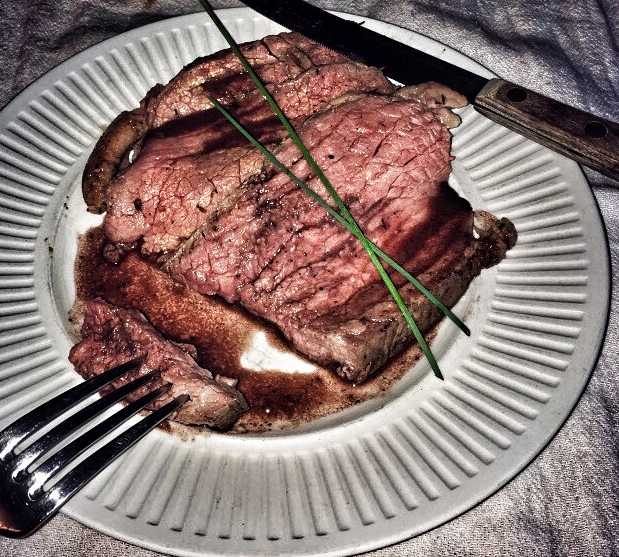 Serve over sliced roast pieces.